A pendulum powered pair of gnashing teeth! Move the box and the pendulum swings, opening and closing the box. Nom nom nom! Members can print out the parts for free, thanks for signing up. 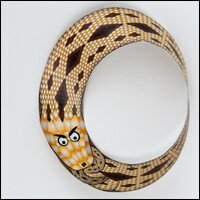 Non members can download the parts for £2.50 at the link at the top. 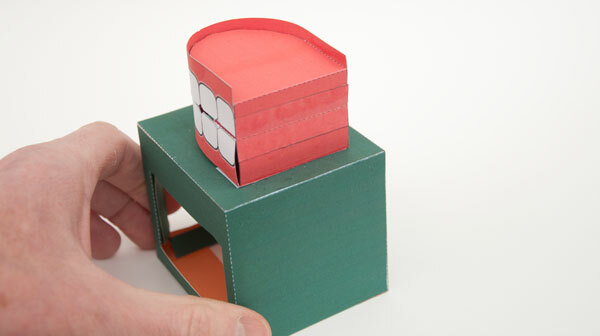 Print out the first three sheets onto thin card, note that the colour version has both front and back pages. 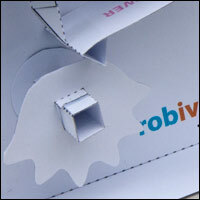 Print out the front of the sheet, flip the sheet round and return it to the printer to print out the back. The forth sheet is for the hinges, print this into paper. 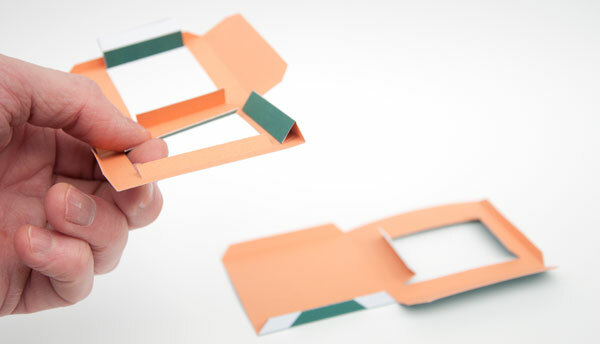 The more flexible paper makes a better hinge than card. 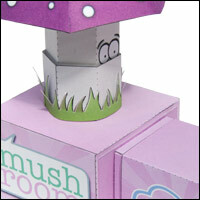 Fold up and glue down the tabs at the bottom of the boxes to make triangular sections. Join the two halves of the box together. 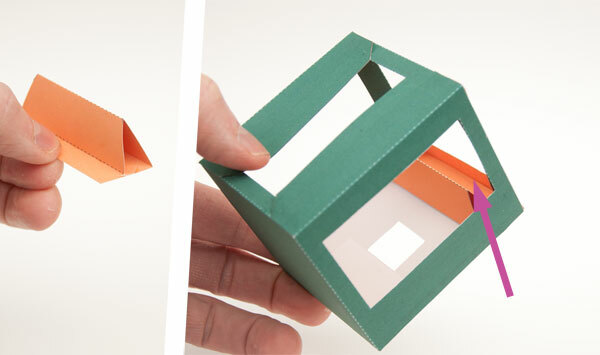 Glue the box lid into place with the grey rectangle to the back of the box. Fold up and glue together the pendulum hanger. 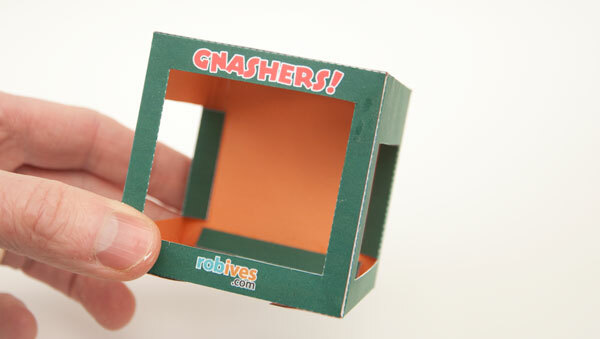 Glue the hanger into the box so that the front edge lines up with the front of the box. Assemble the pendulum. Glue the hinge to the grey area. Make sure you do not get any glue on the crease line. Attach the pendulum to the pendulum hanger. 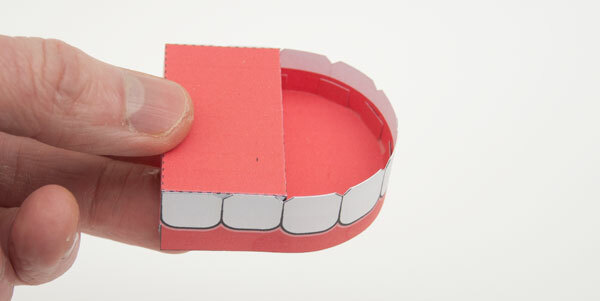 Assemble the lower jaw box. 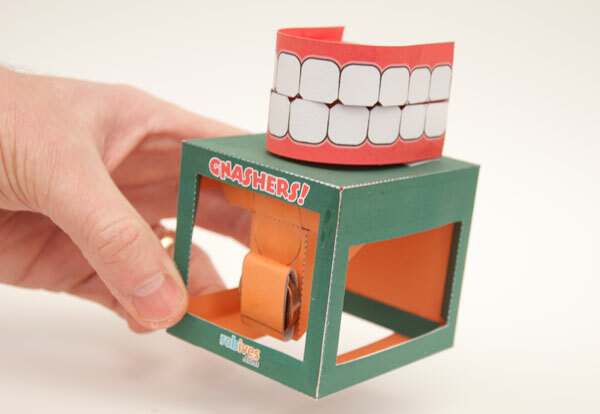 Glue the teeth into place. The grey face on the box is the lower face. 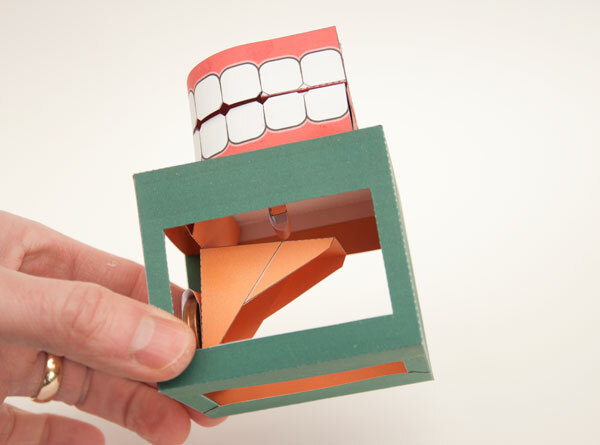 Glue the lower jaw box to the grey area on the top of the main box. Assemble the upper jaw as shown above. 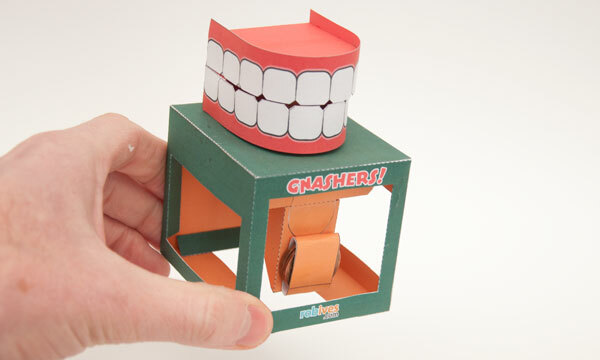 Glue the teeth into place. 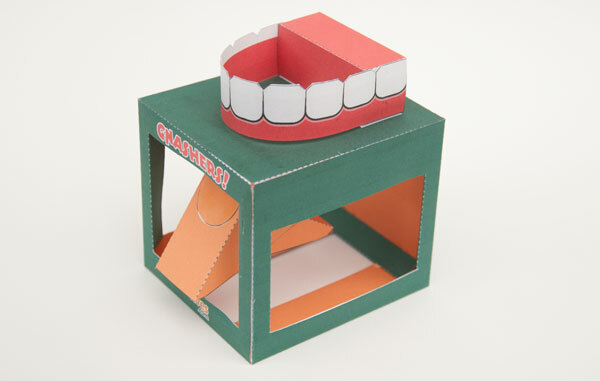 Note that the top of the box lines up with the top of the teeth. 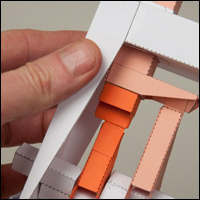 Connect the two jaw pieces with the paper hinge. Fold the coin holder tightly round two 25mm diameter coins. (approx 7 grams each) UK 2p coins are perfect for the job. Glue the coins to the front of the pendulum. Assemble the push rod. Glue the hinge to the grey area as shown. Glue the push rod to the grey area on the upper jaw as shown. 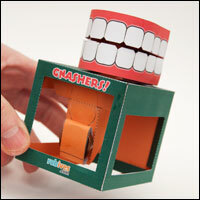 Close the jaw, threading the push rod through the hole in the box top. Done! 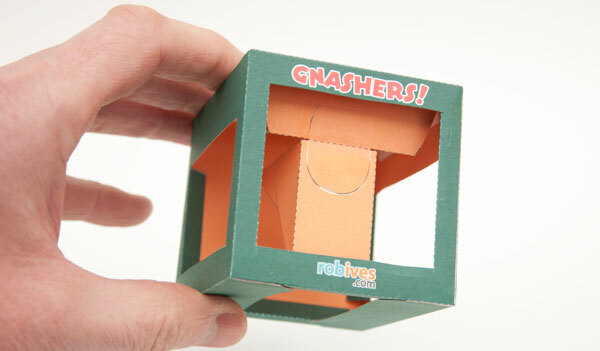 Once the glue is dry, move the box and the gnashers gnash! this mechanism could be fun for any project where you didn't want a delay in the movement just a really quick movement like a rabbit or kangaroo or some big animal if you wanted to be silly that hops really quick. thank you rob for another great model.